Irrespective of how you voted in the 2016 EU Referendum or what you now think is the best way forward, it is hard to deny that the process of ‘doing’ Brexit has become a constitutional ‘fatberg’, clogging up the UK’s political system and preventing the UK government, UK politicians, the media and the public from discussing much else. As the two year Article 50 negotiating period draws to a close, the possibility of a no deal Brexit by default increases by the day. The attentions and energies of (most) politicians remain focused on unblocking the political deadlock. Meanwhile, businesses and citizens are left to speculate as to what a no deal Brexit might mean for them. Lawyers are no different. Many UK lawyers make a living advising their UK clients on EU law. Assuming the UK leaves the EU with no deal on 29 March 2019, this would change overnight. The combined effect of Article 50 of the Treaty on European Union and the EU Withdrawal Act 2018 (EUWA) is that EU law would abruptly and entirely cease to apply to and in the UK. In its place, the EUWA provides that most EU laws will be converted and preserved into UK law as “retained EU law”, a new species of UK domestic law. The result will be that, all of a sudden on 30 March 2019, a significant part of the UK’s legal environment will be reborn in a form markedly different to that which applied the day before. UK lawyers will be advising their clients on rules whose substantive provisions may still largely be the same, but whose constitutional basis and status in the UK legal order would be profoundly unfamiliar and untested. How does the EUWA prepare UK law for a no deal Brexit? The starting point, as many readers will know, is that the purpose of the EUWA is to provide for as much continuity and legal certainty as possible: much of the substance of the rules of EU law will be repackaged and given fresh legitimacy in UK law as retained EU law under the EUWA. However, there’s no getting away from the fact that this is the most comprehensive re-writing of the UK statute book ever undertaken. Total continuity is not an option because retained EU law, by its nature, is fundamentally different from EU law. 1. First, whereas EU law is a body of ‘living’ law that develops over time, retained EU law is a freeze-frame of the EU rules applicable in the UK as at Brexit day. Retained EU law will not develop, it will only stand to be replaced by post-Brexit domestic legislation. 2. Second, whereas EU law is a supranational legal order that applies both to and within the jurisdictions of member states, retained EU law is purely domestic law. None of the EU institutions, its agencies, or any other member states will play any role in the interpretation, application or enforcement of retained EU law in the UK. 3. Third, whereas certain aspects of EU law only function as part of that supranational legal order (e.g. because they require the involvement of EU bodies and/or those of other member states), retained EU law cannot do so. Those aspects of EU law cannot therefore be fully replicated as retained EU law and will need to be preserved in modified form. The government is currently using its extensive delegated legislative powers under the EUWA to make these modifications to retained EU law via a ‘storm’ of statutory instruments currently going through parliament. In the event of no deal, the EUWA will become a central pillar — not just a keystone but a lodestone — of the UK legal system. Its provisions would undoubtedly become as well-known to UK lawyers as those of the European Communities Act 1972 (ECA 1972) that it repeals. And lawyers would need to get to grips with how the EUWA operates very quickly. Most of retained EU law will be comprised of EU-derived domestic legislation and direct EU legislation, each converted and preserved in UK law by ss. 2 and 3 of the EUWA, respectively. However, any other “rights, powers, liabilities, obligations, restrictions, remedies and procedures” that apply and are recognised in UK law before Brexit (via the ECA 1972) but that are not saved by ss. 2 and 3 EUWA may instead be saved by s. 4 EUWA. Section 4 EUWA is intended primarily to ensure directly effective EU law rights recognised and available in UK law before Brexit are retained. However, s. 4 EUWA is open ended and so does not define precisely what parts of EU law it retains, or how those laws are to be enforced. Section 4 is problematic in at least two respects. • First, in relation to directly effective rights contained in the EU Treaties. The EUWA’s explanatory notes provide a non-exhaustive list of 28 directly effective rights contained in provisions of the EU Treaties that the government considers s. 4 EUWA to retain in UK law post-Brexit. These include, perhaps surprisingly, the rights to free movement of goods, workers, services and capital. While the explanatory notes make clear that it is the right itself rather than the text of the provision that is retained, it is still far from clear how such rights, particularly those that impose obligations on EU member states in respect of upholding the rules of the single market, could continue to be recognised and enforced in any form in the UK post-Brexit. • Second, the application of s. 4 EUWA to EU Directives is also unclear. EU Directives are not themselves retained by the EUWA and s. 4(2) EUWA provides that no directly effective rights arising under an EU Directive are retained unless they are “of a kind recognised… in a case decided before [Brexit]” by the Court of Justice of the European Union (CJEU) or any domestic court. This gives rise to the question: what does “of a kind” mean in this context? Are such rights limited, as stated in paragraph 98 of the explanatory notes, to those “arising under a particular directive that have been recognised by a court… as having direct effect” or could such rights include any rights “of a kind” that have been held by a court to be capable of arising from such a directive? It is understandable why parliament wanted to include s. 4 EUWA as a ‘catch-all’ provision in the EUWA to ensure nothing in EU law that it is important the UK retains post-Brexit is missed inadvertently. However, it is clear that s. 4 EUWA is likely to be a source of significant legal uncertainty in the event of no deal. Clever lawyers will not be able to resist testing the scope of exactly what has been retained via this uncertain conduit pipe of a provision. Given that the only definitive means of obtaining an answer is via the courts, we can expect litigation in this area. Anyone who advises on, or has studied, EU law will know the importance of CJEU jurisprudence when interpreting the meaning of EU legal instruments. How are lawyers to approach determining the relevance of such case law after Brexit to the interpretation of retained EU law? • CJEU cases decided before Brexit continue to bind most UK courts (other than the Supreme Court and, in Scotland, the High Court of Justiciary) in respect of any question as to the validity, meaning or effect of retained EU law. A closer look at the EUWA’s provisions, however, reveals some scope for uncertainty. In relation to post-Brexit case law, while UK courts are no longer bound, they “may have regard” to anything done after Brexit by any EU body (including the CJEU) so far as it is “relevant” to any matter before the court (s. 6(2) EUWA). It is not difficult to see how this “relevance” test is likely to encourage lawyers to argue (on a case-by-case basis) that the court should or should not continue to follow a potentially relevant CJEU case. Further, the words “may have regard” also suggest there could be considerable flexibility, and thus uncertainty, in the approach that courts adopt in their decisions. Therefore, to the extent that any retained EU law has been modified during or after its transposition onto the UK statute books, the relevant CJEU case law may no longer apply in the same way. The implications of this are not merely hypothetical; many hundreds of statutory instruments are currently being made precisely to modify retained EU law. It is therefore possible that a great number of CJEU cases that would otherwise still bind the courts could arguably no longer apply (or not apply in the same way) to those modified provisions of retained EU law. If so, to what extent do they remain relevant, if at all? It is remarkable that, throughout the UK’s 45 years of EU membership, it wasn’t until R (Miller) v Secretary of State for Exiting the EU , in which the Supreme Court considered whether the government could lawfully trigger the UK’s withdrawal from the EU without parliamentary approval, that lawyers finally understood how EU law was brought into UK law via the ECA 1972. It is likely that something similar will be true in the event of a no deal Brexit. The changes brought about will be sudden, and possibly dramatic. However, given the ambiguities in the EUWA, it is only through pioneering and innovative legal arguments before the courts about the nature and extent of retained EU law that our appreciation of the implications of no deal for the UK’s legal system will develop slowly over time. In the meantime, while the very basis of a significant chunk of our legal system will be on a new footing, gingerly taking its first steps into the unknown, uncertainty will abound and the scope for probing legal debate will be significant. Andrew Eaton is an associate in public law and policy at Hogan Lovells. 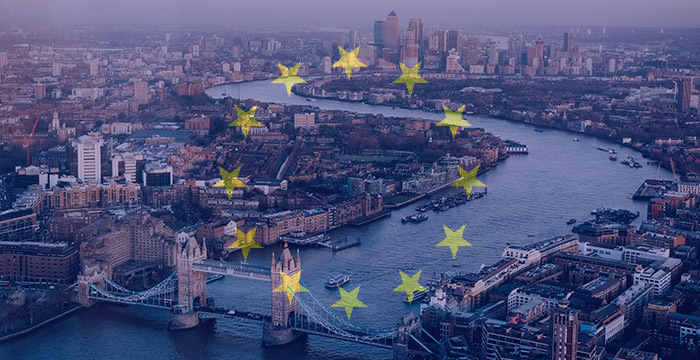 Andrew Eaton will be speaking alongside lawyers from Ashurst, Henderson Chambers and Shearman & Sterling at Thursday’s Brexit-themed commercial awareness event, ‘How will Brexit disarray affect future lawyers?’ at ULaw Moorgate. You can apply to attend the event, which is free, now. Can I advise my market trader client, currently in a stand-off with Trading Standards, that in the event of a no-deal Brexit he will be at liberty to sell fruit and vegetables in pounds and ounces with no obligation to include a metric price too? With the amount of lawyers being struck off by the SRA, and a lawyer MP going to jail. The EU will be a safer place once the UK leaves.